Welcome to day one of the MCT 33rd Edition Release Week! We have sneak peeks for you all week and a blog hop on Friday! I hope everyone is as excited as I am! I can't wait to share this release! I LOVE it so much. Im so happy Miss Emma asked me to be a guest designer for this release! This release is filled with several stamp sets and dies! For my project, I used the new "Happy Thoughts" stamp and die set. Its perfect for smash books and project life! I made this quick and easy page in my summer smash book. This is my third year doing this and Emma's products make this so easy! Check out the video down below! What do you guys think so far?? Super cute right?? Make sure you check out the rest of the design team for more sneaks! Thanks for stopping by! Big crafty hugs! Your page came out just PERFECT!!!! I LOVE that you do this & something that will be cherished forever!!! GREAT job my friend! Congrats on being Miss Emma's guest designer for today!!! What an outstanding and creative job!! Love how you used Sneaky Peek #1 goodies and love too how you used all of Miss Emma's goodies your LO is so precious you are a very so very talented scrapper a gal after my own scrappin' heart! nancy, nice to have you back with us! you certainly are the queen of smash books! awesome! Super SMASH page! Love all the detailing you did with MCT products including the new ones. Great page and cute kids!! Thanks for the inspiration!! Very cute. I like the pocket for more photos. Love your page, so pretty. 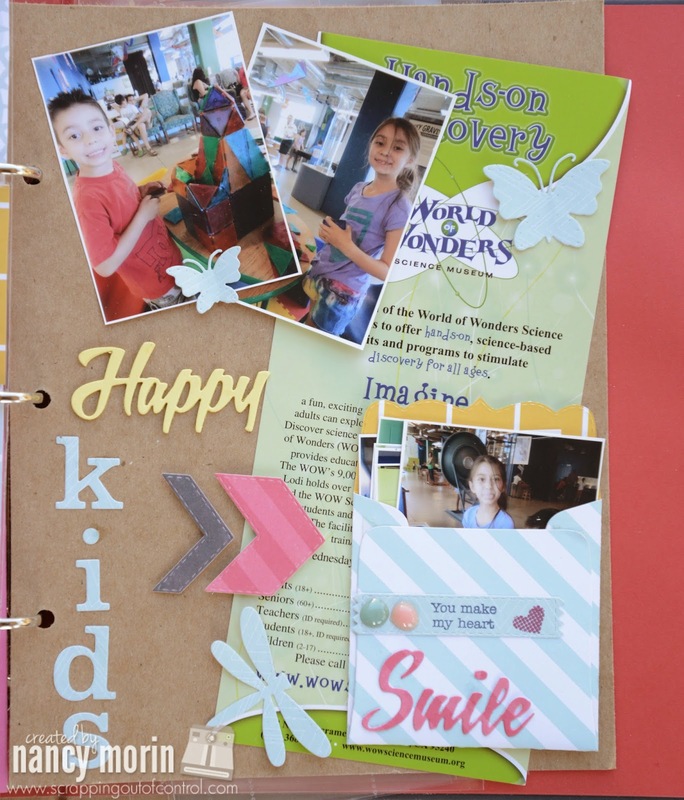 This is a great release for using in Smash Books or Project Life. What a fabulous page!!! Hugs!!! Congrats on your GD selection. How exciting! You smash page turned out wonderfully. Thanks for sharing. Adorable! Your projects are beautiful. I love the colors, stamps, and dies you used! TFS! A great smash page and a great way to showoff the new release. Awesome job! What an incredibly delightful layout and amazing video! Once again, you've worked magic with these two new 'sneak peek' products! Fabulous all around! You've showcased the new 'must haves' marvelously! 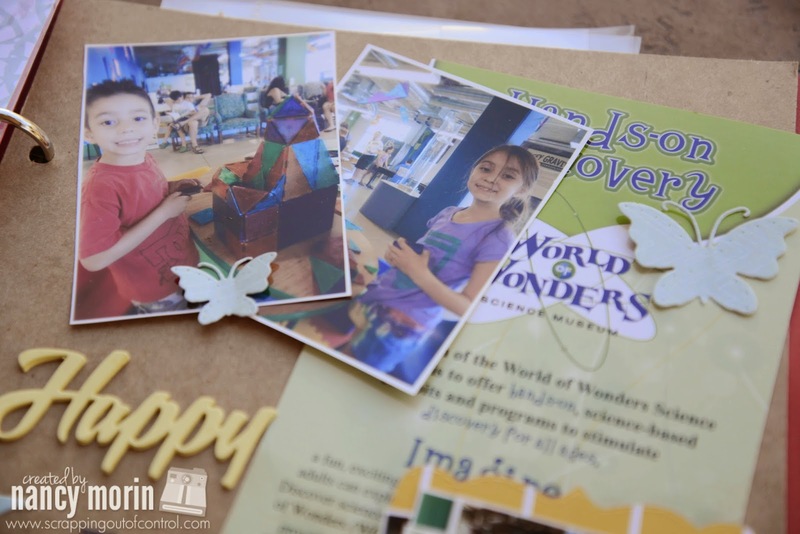 Amazing use of so many cool die cuts and love the cute mini envelope. Miss Nancy, Super cute smash page! Your video makes it look sooo easy! keeley kats at comcast.net Thanks for the inspiration! Beautiful done! Love this smash page! Loved the video and loved Rascal Flatts! Your layout is really fun. Great job!!! Your summer book and page today look great. Science museums are so much fun to take the kids to. Great job on your video...I like the music and watching you put your pages together. The sets shown today look great on your page...I like the envelope to hold extra pics. I love the large words being released...I am so excited about them. Super job on your page. Nice layout page! 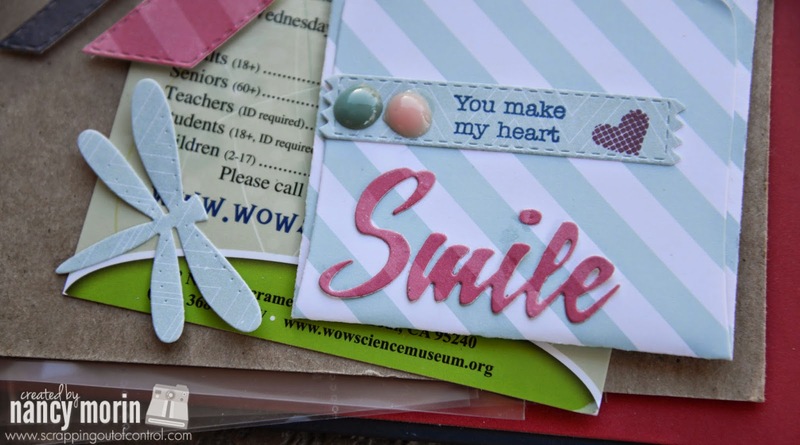 Love how you put the pictures in the little pocket/envelope and used the flyer to accent the background then paired it up with the MCT sentiments and dies! It's Fantastic! Your layout is great!! Love it and the new dies and stamps! !